Payoff.com believes the way to a debt-free life has to do a lot more with the carrot, not the stick. And while paying down debt is never fun, the site's animated interface and use of cash rewards make the task a lot more engaging. 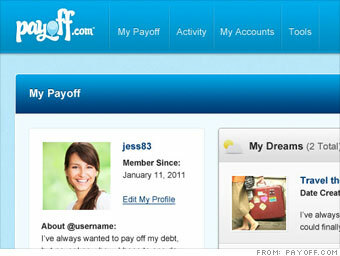 The site allows you to set goals and track your spending over a range of financial accounts. Once you meet a specific goal or conduct certain financial actions like checking a credit score or paying off a credit card, you earn a badge. Collect enough of these badges and you can earn $25 in cash (you actually get a check in the mail). Along your debt-busting path, the site offers tools and blog posts to help with your particular financial situation. Since the site is all about positive reinforcement, Payoff allows users to share their accomplishments with friends and family over social media outlets like Facebook and Twitter. As you advance from one goal to another, Payoff recommends products and tools it thinks you might find useful like checking and savings accounts. However, these suggestions include offers from institutions you already bank with, so you won't be able to shop around to see if another bank has a better option. Since launching in June, the site has helped users pay of more than $7 million in debt, and has given out $12,000 in cash rewards. These seven people are drowning in debt and many don't see a light at the end of the tunnel. Debt busters: Where are they now?